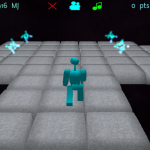 Neon Starlight ($1.99) by Adam Latchem is an arcade game where walking is more difficult than you realize and keeping your feet, firmly planted on the ground is more beneficial than floating around in space. Players control a magnetic-footed robot that walks along slim paths which have endless drops on either side. He moves automatically, but you control whether he goes left, right or hovers. To make him go left, tap the left side of the screen. To make him go right, tap the right side of the screen. 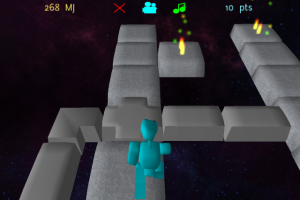 To make him hover, tap the center of the screen and he will lift off the ground in order to jump gaps on the course. The robot uses energy to move around. When he hovers, he uses a bunch of energy. You only want to make him hover when it is absolutely necessary. If the robot runs out of energy, the game is over. The goal of each level is to collect Ignited Pollucite Crystals. The crystals are placed in various locations on the course. Some of them are very difficult to get to, which is why you might need to hover. Once you’ve collected all of them, a portal opens up and you continue to the next level. This game is way too hard. 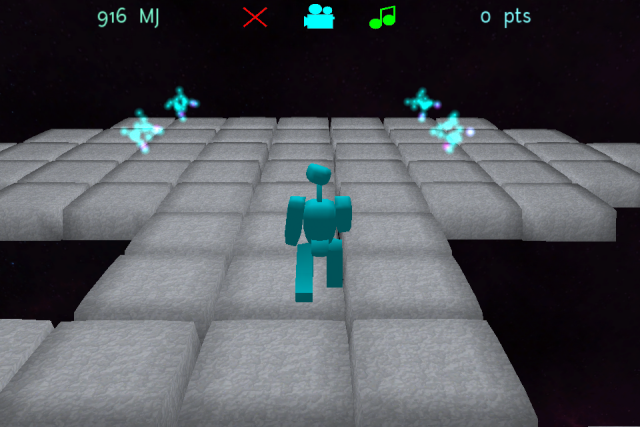 The training level lets players have 1,000 points of energy, but on the first level, the robot only has 600 points. That energy depletes way too fast. I was never able to successfully complete the first level. I played it over and over, about 15 times. This may be a selling point for some people, but I ended up stopping out of frustration. This is an interesting game. Its purpose, according to the app summary page, is to “infuriate and entertain you.” Unfortunately, it infuriated me so much that I forgot to be entertained. The levels are very challenging. If you are a dedicated player of casual games, you may like the difficulty involved. The app is well made and good looking. It is a great game, just too hard for me.